FOLDS EASILY AND "POPS" OPEN FOR EASY STORAGE AND USE! 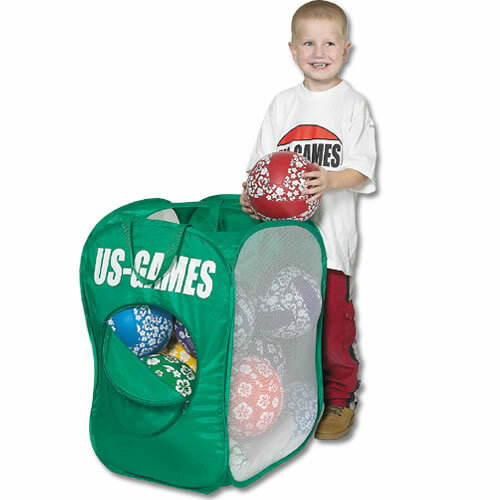 Take them out of the bag, ''pop'' them open and they are ready to store your lightweight equipment (balls, beanbags, flying discs, etc.). Each class or group can now have their own colored bag with their equipment in it. Each nylon bag has a handy zippered opening for easy access to equipment at the bottom of the bag. Size when open 30''H x 17''W x 17''D. Each set includes 1 of each color: Blue, Green, Orange, Purple, Red and Yellow.